Giving a free breakfast to every primary school child in England could cost more than treble the £60m the Tory party set aside for it, academics say. Experts analysing the plans re-costed them at between £180m and £400m, depending on how many pupils take them. A Conservative Party spokesman said the original £60m costing of its universal offer was based on a 25% take-up rate. Researchers at Education Data Lab say it also assumes food costs of 25p per pupil and does not include staff costs. In their manifesto, the Conservatives said they would scrap free lunches for infant school children in England, in favour of a universal offer of a free breakfast for all primary school children. The £650m savings from the scrapping of school dinners would be recycled into school budgets, it said, adding that a free breakfast would be offered instead. Academics led by Dr Rebecca Allen analysed the costing of the pledge, and discovered it was based on an evaluation of a particular charitable scheme, called Magic Breakfast. This evaluation, by the Education Endowment Foundation and the Institute for Fiscal Studies (EEF/IFS), did not, however, include the cost of staffing the breakfast club. Dr Allen said it also did not take into account that Magic Breakfast relied on donated food. Researchers at Education Data Lab found the full cost of the scheme would be anything between £180m and £400m, depending on what proportion of children took up the offer. If 50% of children took up the offer, researchers said the scheme would cost £400m. Responding to these findings, a Conservative Party spokesman said: "We're promising to set up a free breakfast club, similar to the ones that the EEF/IFS said were as useful as universal infant free school meals, so that every child who would like a breakfast in school can have one. "These clubs didn't have 100% uptake - only about 25% of children attended, as in a Department for Education trial of breakfast clubs - but they still had positive effects for all the children in the school. 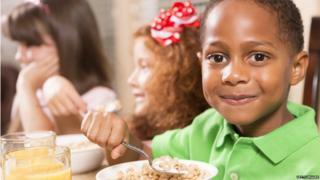 "If many more children now start eating breakfast in school, then the costs will go up - but the evidence of two large trials is that they won't." Speaking at an Education Media Centre press briefing, Dr Allen said: "They say it's going to cost £60m but we think it's going to cost something over £200m to £400m. "It's a problem because they wanted to scrap universal free school meals for infants and take that and put it back into the general slug of the education budget. "We think that they can't manage to do that if they are going to deliver free school breakfasts." She added that if the free breakfast clubs acted as a proper child care substitute, then many parents would switch from their existing childminders and providers into the free clubs. "Therefore we feel take-up would be substantially more than 25%," she said. She said as the scheme was not well enough funded, there would be an incentive for head teachers to downgrade what they could offer so as to make it unpopular with parents. Head teachers were being told "you have to deliver a policy, but you are not being given enough money, to do it", she said. "Think about what your incentives are as a head teacher. "Your incentive is that it doesn't act as a childcare substitute, and that it is an undesirable offer for children. "And that sounds like an awful thing to say, but the state of funding in primary schools now at the moment is that you can't cross-subsidise it," Dr Allen added. Later, a Conservative Party spokesman said: "We will ensure that all primary schools can offer a free school breakfast to every child in every year of primary school as we set out in our manifesto - independent evidence shows this is a cost-effective way to improve education and health results for pupils. "More broadly, we will increase the schools budget so that by 2021-22 we will be spending £4bn more on schools than now. "This represents a real terms increase for every year of the Parliament, underpinned by a strong economy." Dean Horridge, chief executive of Fit For Sport, which runs breakfast clubs in schools, said the Conservative estimate was "unrealistic". He added: "The Fit For Sport average charge for our breakfast club is £4.20 per child per day but the costs well exceed that of the Conservative's projected 25p per child per day. "We strive to ensure that children are provided with a nutritious and cost-effective start to the day. "That's why we provide the optimum balanced combination of nutrients to help children perform in the classroom but at 25p per day we do not feel that this could be replicated."